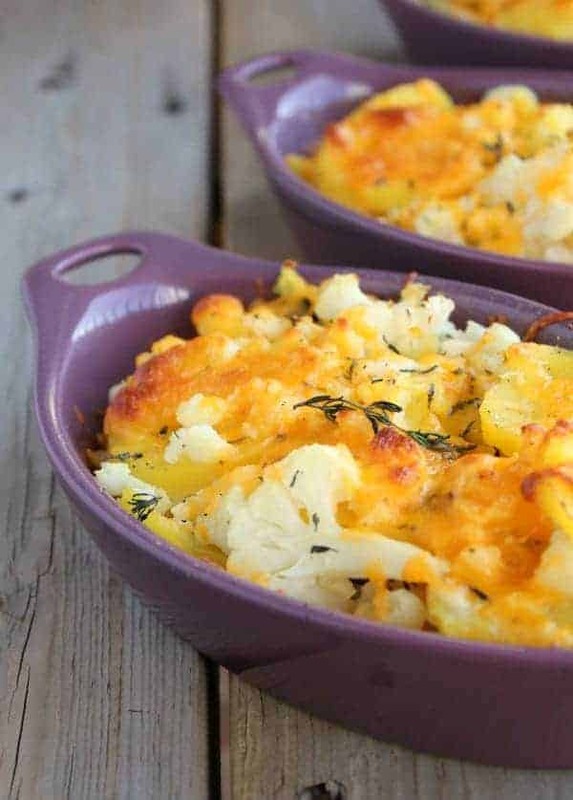 This Cauliflower, Potato and Cheddar Bake is a perfect side to either lighten up your usual potato dish or add in some extra vegetables. It is super easy to make and will taste great any time of year, not just at Thanksgiving. I made this using these pretty purple dishes and a great mandoline to slice the potatoes and cauliflower. I’ve been dying for a mandoline so when Big Kitchen approached me about teaming up it was my first choice. And I just love these adorable dishes! I can’t wait to make individual servings of all sorts of things in them. I’ll probably start with macaroni & cheese but that should come as no surprise. And the mandoline is great too! It took a little getting used to, but I have big plans for it as well. Once I got used to it, it was very easy to use. It has a button that you can just press to adjust thickness and it also has blades to julienne and cube. Another great feature is the storage holder for the extra blades. This is a huge safety advantage–this way they aren’t loose in your pantry or wherever you store them. You can even use it as a drying rack to dry the blades after using them. 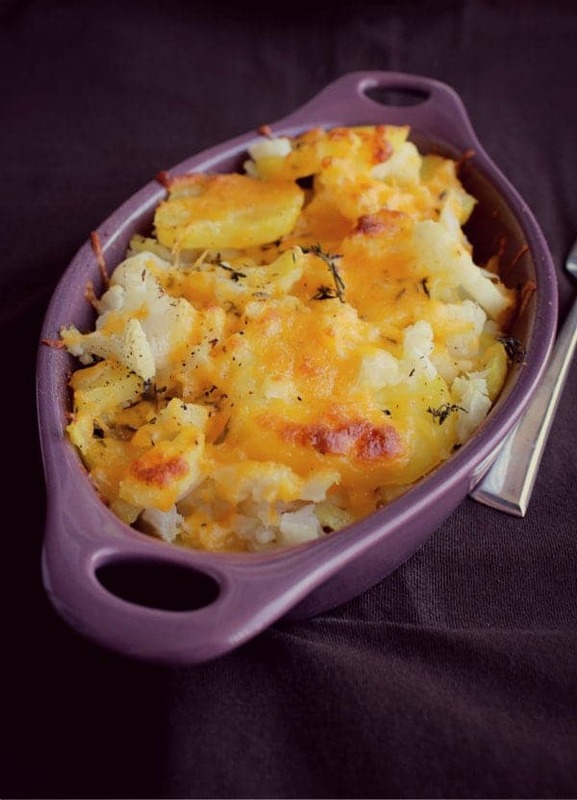 This cauliflower, potato and cheddar bake is perfect when you are looking for a slightly healthier potato side with plenty of cheesy goodness. Preheat oven to 450 degrees F. Spray three 12-ounce baking dishes (or a 1 quart baking dish) with non-stick spray. In a large pot, cover potatoes with cold salted water. Bring to a boil. Once boiling, add cauliflower and cook about 8 minutes or until potatoes are just cooked through and cauliflower is tender. Drain in colander and let sit at least five minutes. Divide the cauliflower/potatoes up between the three baking dishes. Sprinkle with pepper and thyme. Top with cheddar (divide evenly between three dishes). Pour over milk (divide evenly between three dishes) and dot with butter. Bake for 10-15 minutes or until cheese is golden brown and bubbling. If you use a single larger baking dish, I would recommend doing two layers (potato/cauliflower, thyme/pepper, cheese, then repeat and then finish with milk and butter). 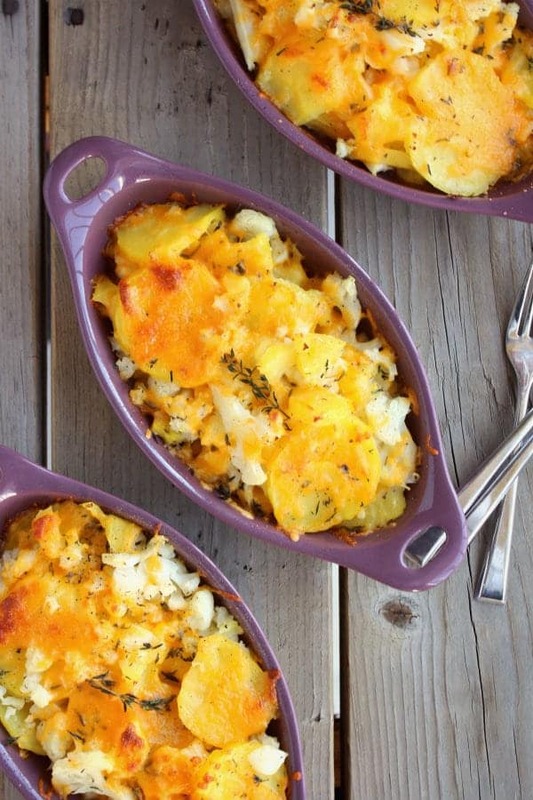 Verdict: LOVE this flavorful cauliflower, potato and cheddar bake. Husband’s take: He loved this – he’s not a huge potato fan so he enjoyed them being thinned out with cauliflower. Disclaimer: I was provided with the products mentioned above but no monetary compensation. Opinions are as always, 100% my own. Going to make this for Thanksgiving! Toasted Pine Nuts and Wild Rice with Mushrooms…yummm! My favorite side dish is Macaroni and Cheese, definitely a timeless classic! I can’t wait to try out this dish though, but I think I may substitute the yukon potatoes with sweet potatoes! The stuffing is my favorite. I could actually forget about everything else and just have a big plateful of stuffing! Fried okra salad is my favorite Thanksgiving side dish! So weird and so great! Love your posts! Cranberry Sauce, or maybe stuffing, but I really like the mashed potatoes, so so many. I absolutely LOVE green been casserole on my Thanksgiving plate. My favorite variety is with chopped water chestnuts and of course French fried onions. I sometimes crave this dish so much around the holidays that I’ll make it as the main meal for a dinner. Scrumptious. I think I follow you on the RSS feed ….. Lol I get your emails is that it ?? My favorite side dish is the mashed potatoes! “liked” Big Kitchen on FB–I am cooking more these days & love this site! Those little 12 oz. 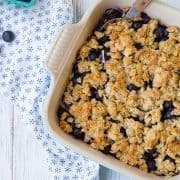 baking dishes are perfect for all of the cooking for 2 that I do. My sister makes the most amazing Sweet Potato Balls. It’s a side dish training to be a dessert, I think! Sweat potatoes with brown sugar and butter,baked to golden perfection! “Liked” Big Kitchen on Facebook. Stuffing! with a crunchy top! My favorite Thanksgiving dish is the dressing with gravy. My favorite thanksgiving side is a Sweet Potato Soufle from Tyler Florence.. I saw him make it on Food 911 years ago, and family demands it at every holiday. Its a bit of work, but sooo good. Instead of marshmallow on top, Tyler uses an italian meringue. Yum! and I made homemade pecan pralines for the recipe also.. MMMM. Following Rachel Cooks on Twitter as well. Following Big Kitchen on Twitter. Brussels sprouts, all the way. I am a sucker for cranberry fluff! These dishes are so cute and the recipe isn’t all that bad, either! My favorite thanksgiving side dish has to be green bean casserole! Mashed potatoes or rolls would be my favorite side! My favorite Thanksgiving side dish is roasted Brussels sprouts with bacon! I “Like” Big Kitchen on Facebook. Such a hard question, I love so many sides. I would have to say cranberry sauce though, since fresh cranberries are only available this time of year. Followed closely by any form of stuffing though. This recipe looks great, won’t be able to make it for Thanksgiving but I think it would make a great dinner on a cold night. 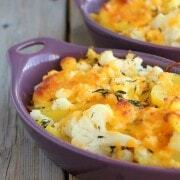 I love cauliflower and adore the fact that you use it to lighten up a deeeelicious side dish! The cheddar and potatoes sound great along with the cauliflower and this is the perfect dish for my family’s thanksgiving meal! It is so hard to choose, but I’d say my fave side dish is sweet potatoes. yum! I follow Big Kitchen via twitter @ciaomjc. I follow Big Kitchen on fb. My favorite side dish is my broccoli rice cheese casserole. One of my favorite sides are charred brussel sprouts with bacon and a splash of cider vinegar. So yummy and adds an interesting flavor profile to the dinner plate. I love the sweet potatoes!! i love mashed potatoes!!! lots of them. I am following Big Kitchen on Twitter. This looks yummy btw! Don’t you just LOVE slicing potatoes with a mandolin?? The first time I used it I was especially impressed and thankful that I didn’t have to slice perfect/thin potato rounds anymore. Yay. :) This one looks so much nicer than mine though! My favorite side dish is zucchini boats, they are hallowed out zucchini with spinach, cheese, and bacon bits on top. So good! That recipe sounds delicious! Can’t wait to give it a try. My favorites are mashed potatoes, and sweet potatoes! These colors are perfect! I do love my mandoline but I don’t use it nearly enough. This looks so good! I follow you on Pinterest, that evil website that can kill any and all diets! I happily get your email updates at jefflammers@rocketmail.com. My favorite Thanksgiving dish is/are sweet potatoes. I actually love them anytime and it doesn’t matter how they’re prepared, be it baked, in a casserole, mashed or cut into fries. Love my grandma’s waldorf salad. It is rich, delicious and calorie loaded. Love holidays . I subscribe to york RSS feed. My favorite Thanksgiving side dish is whiskey glazed carrots. I have been wanting to get a mandoline!! I want to make beet chips!! I want to make beet chips too! And apple, and sweet potato, and potato, and carrot. Eeee! Can’t wait to use it more. Easy… sweet potato casserole, loaded with marshmallows! Yum. I look forward to them all year long! Mine would be sweet potatoes. thanks! I love sweet potatoes that are baked like normal potatoes! What an amazing giveaway!! One of my favorite sides is homemade cran sauce. Love cranberry season!! Yum! What do you put in yours? I’ve been dreaming of owning a mandoline slicer! And this recipe looks delicious. Thanksgiving at our house wouldn’t be the same without my mom’s amazing sweet potato casserole! Love the sweet potatoes! Any way, shape or form. Im a sweet potato girl. Add some brown sugar and marshmallows and its goo to go in my book. My Momma’s dressing is my favorite side…ever! I like mashed potatoes and gravy. My favorites sides are the dressing and the mashed potatoes. Thanks for offering the giveaway. I like Big Kitchen on FB too, thanks so much! My mom’s stuffing is my favorite, hands down! This bake looks so cheesy and comforting! Total comfort food.. love it. My favorite thanksgiving side dish is green salad with tomatoes, avocados, cucumber, spring onions, and dressing. Goes good on leftover turkey sandwiches too! Sounds fantastic! I love the freshness that would bring to the table. Sweet potatoes and green beans! I have been wanting a mondoline too! Your dish looks great and like one everyone would eat too. I follow you on fb and subscribe! Our Thanksgiving tradition for over 50 years, is homemade noodle soup and rutabagas. No matter what else is served these 2 dishes are always there. Honor of our Grandmother and Mom. I love green beans as long as they aren’t all soft and mushy. Pinterest!! I follow a few of your boards. I’ve also been wanting a mandoline. Homemade stuffing is my favorite! Husband loves Cauliflower, so may make them for him . My favorite side dish is…the rolls! I’m a carbaholic. Haha! You really can’t beat a good roll–slathered with butter, of course! I love stuffing! I could just eat a ginormous plate of it and nothing else! Congrats, Katie! This is the winning comment. Please check your email as these emails sometimes get sent to spam. Thanks! Usually the cheesey potatoes are my favorite, but this dish may take their place this year! My mother’s stuffing ! It’s to die for ! I dont know how to do twitter, but if I did…I would follow you both! I followed Big Kitchen on Facebook. Are they on Pininterest? I followed Big Kitchen on facebook! 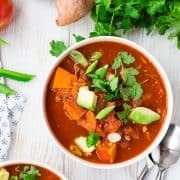 I followed Rachel Cooks on Pininterest. I followed Rachel Cooks as an email! I follow Rachel Cooks on Pinterest. :) Thanks for the great giveaway! I love a good potato salad during the holidays! 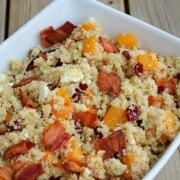 My favorite side dish is always whichever one includes butternut squash, I can’t get enough! Stuffing and mashed potatoes are my FAVs!! I already get your email feed. Hard to pick gonna have to say stuffing! Like” Rachel Cooks on Facebook . Stuffing is my favorite. I think I want to try oyster stuffing this year and see how it goes over. My favorite side dish is the stuffing! My mom and I always make my Grandma’s recipe, and it is the BEST. Bread Stuffing, specifically without organ meats, nuts or fruit… picky picky! I always go for the sweet pototoes. I “Like” Rachel Cooks on Facebook. I have to say my homemade noodles with Turkey gravy. I love my pasta’s. And my family demands that it be serve at every Holiday meal. It is a toss up between mashed potatoes and gravy and the sweet potatoes with all the fixings! I LOVE those dishes! Mandolins have scared me off ever since an unfortunate incident involving my thumb getting too close to the blade! How adorable! The stuffing is my favorite!